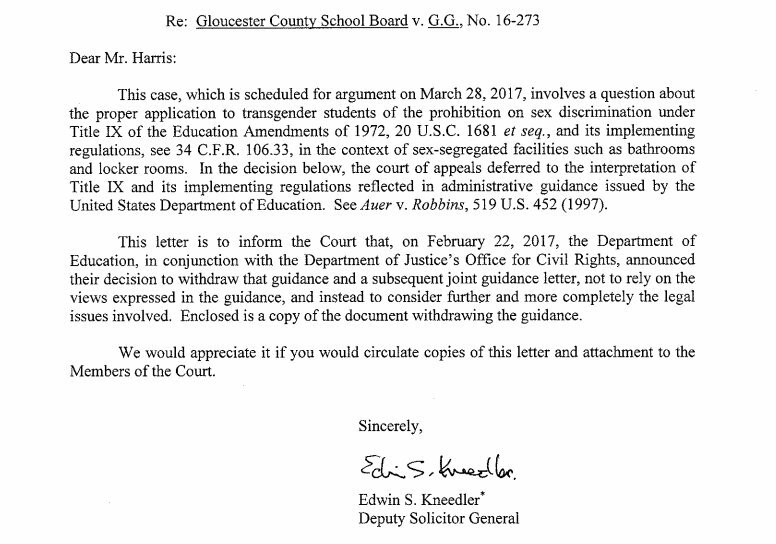 Yesterday, Mark Hensch at TheHill.com reported here that the Office of the Solicitor General had notified the U.S. Supreme Court in Gloucester County School Board v. GG that the Trump Administration was re-evaluating its position. GG is Gavin Grimm, a transgender student who wants to use the men’s room at school. 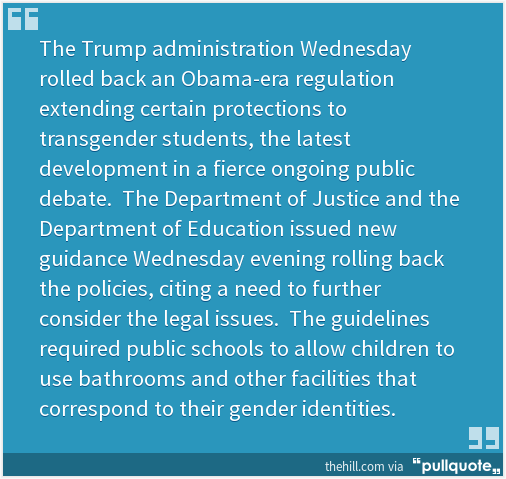 The New York Times previously reported (here) that “the question of how to address the ‘bathroom debate,’ as it has become known, opened a rift inside the Trump administration, pitting the education secretary, Betsy DeVos, against Attorney General Jeff Sessions.” Ms. Devos supports transgender rights; Mr. Sessions not so much. Earlier this month, Mr. 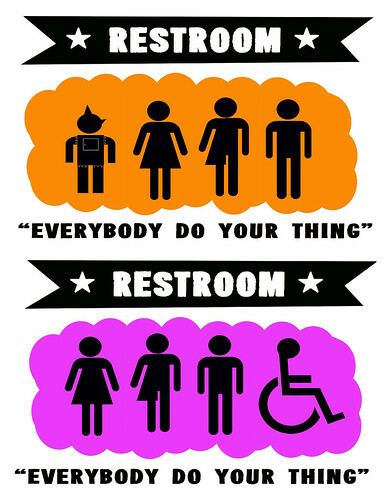 Sessions withdrew a request to limit a federal judge’s injunction against President Obama’s Executive Order requiring public schools and most federally-funded universities to provide enough bathrooms to enable transgender students to use based on their gender identity. Which, brings me back to the workplace and the EEOC. Shortly after asking the Sixth Circuit in EEOC v. R.G. & G.R. 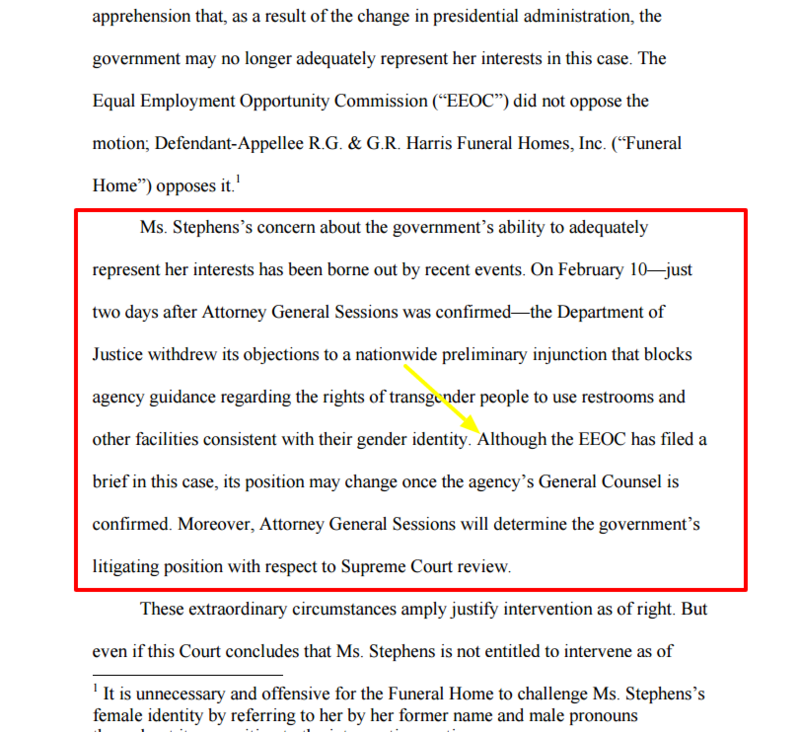 Harris Funeral Homes for more time to file its appellant brief — a move, which coincided with the ACLU’s attempt to intervene on behalf of the transgender individual on whose behalf the EEOC had initiated litigation — the EEOC ended up filing its appellant brief. In that brief, the EEOC continued to argue, as it had before the lower court, that Title VII covers discrimination based on transgender status. In case you were wondering, the President appoints a General Counsel to support the EEOC and provide direction, coordination, and supervision to the EEOC’s litigation program. Don’t lose the forest for the trees. As Joshua Block, the ACLU attorney representing Gavin Grimm in the case before the Supreme Court, tweeted, regardless of what the Trump administration’s position may be on transgender rights, Title IX speaks for itself and the Supreme Court must decide what the law requires. Same goes for Title VII and your workplace. If the EEOC decides not to pursue claims like in Harris Funeral Homes or others on behalf of transgender employees, the ACLU will. So, will plaintiffs’ lawyers across the country. Ultimately, courts will decide this issue — unless Congress acts first. And it doesn’t appear that Congress is going to do so. The mantra thus far in 2017 is that issues like these should be decided at the state level. Indeed, many states have already enacted protections for LGBT employees. Plus, as I’ve said many times, regardless of federal, state, or local law, you are free to implement policies protecting your LGBT workers. It’s your business. Until a court rules otherwise, you don’t have to align with the feds’ position on LGBT rights.